Jonathan Hollow, Head of Financial Capability, Strategy and Innovation at the Single Financial Guidance Body reflects on lessons learned at an OECD summit, and the challenges that lie ahead for financial capability globally. 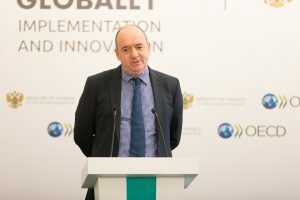 In November 2018 the OECD and the Russian Ministry of Finance gathered together representatives from hundreds of countries that are working to improve the money management skills of their population. It is a surreal and exciting experience to be in direct dialogue with representatives of so many countries, with so many diverse cultures and financial systems, yet working on what now appears to be a universal challenge. It is also humbling when many people you meet say that they admire the work done in the UK as an example of thought leadership that other countries would like to follow. I presented on the headline results from our over £11 million What Works Fund. This seems to be the largest body of impact evaluations on financial capability conducted by any single country at the same time. There was considerable interest in the results and several leading countries have kindly offered to act as peer reviewers for the results of this fund. Many countries choose to prevent on very specific projects, which is fascinating, but means that it is not always easy to build up a broader picture. There is an increasing trend to put a statutory duty to coordinate a national financial capability strategy in law. Only a handful of countries have done this, but the UK is among them, with the establishment of a statutory duty for the Single Financial Guidance Body to coordinate a national strategy. All countries struggle with the challenge of setting national, population-level targets for change in financial skills. The levers of control are hard to understand and manage; and the macro-economic factors in the economy can easily outpace any modest gains. For example, in 2011 South Africa set some brave targets for skills in financial control and planning skills. They found after five years that control skills went up, but planning skills dipped. It is not clear why. The general consensus was that difficulties with national targets make dialogue with politicians very challenging, but work should not be devalued as a result. Many countries are turning their gaze to the workplace as an important venue for financial education. The Netherlands and several other countries have formed a working group to look at challenges and opportunities. This too is an area where the UK’s Financial Capability Strategy has channelled efforts for several years, and HR directors of the largest businesses are beginning to engage. There is understandable ongoing fascination with digital technologies, especially apps, as enablers for financial education, but with many false starts. Aflatoun, an enterprise and financial education charity working with young people in many countries, told an interesting and frank story of their stuttering initiatives to turn workbook materials into compelling digital tools. After some false starts they realised that they were getting increasing numbers of requests from third-party digital producers to use their content. So they changed their strategy to be a content provider enabling other people’s digital expertise, rather than trying to be a digital leader themselves. This seemed to resonate. Many speakers focused on the financial education of children, but none was more interesting than Veronica Frisancho from the Inter-American Development Bank. She presented the results of a study in Peru of many financial education initiatives in many schools, a truly impressive evidence base. A key but sobering conclusion was that the higher the stakes that the children had in the educational experience, the more impact it had. She was talking about testing, exams, or other ways of ensuring the education “mattered”. And yet, at least in the UK, much financial education in schools is delivered as a bolt-on to the subjects that are considered “real”, “core” curriculum, and examined. Much needs to change. Hundreds of countries are working on financial capability, nearly 100 have a formal strategy, and a handful have a national strategy set in law. It looks like financial capability is a worldwide movement with considerable momentum. Most countries have been on this journey for less than 15 years. There is a great deal to learn, but there are tremendous opportunities for countries to learn from each others’ experience, data and research. Learn more about the Financial Capability Strategy for the UK.